In July 2002, the Quecreek mine accident in Pennsylvania revealed the deficiencies of outdated 2-D mine maps. Nine workers became trapped in a flooded coal mine for 77 hours, even though their maps indicated that they were hundreds of feet away from the abandoned mine. In May, an autonomous robot capable of producing 3-D maps set out to explore the Mathies Coal Mine near West Elizabeth, Penn., about 60 miles northwest of the Quecreek mine. Dubbed Groundhog by its inventors, the robotic vehicle entered the 1,067-meter shaft around 11:00 a.m. on May 30 to attempt the first autonomous navigation and mapping operation of a subterranean space. On May 30, a team of engineers led their robotic, 3-D-mapping robot, named Groundhog, into the Mathies Coal Mine in Pennsylvania. Robots like Groundhog could help people make planning decisions about land in and around abandoned mines. All photots courtesy of Sebastian Thrun. While members of the media watched from behind barbed-wire fences on a nearby overpass, Groundhog rolled up to the mines entrance, stopped, took a look around by tilting its laser sensors up and down, and then disappeared into the shaft. For several hours, the engineers were able to pick up a radio signal that the robot transmitted to tell them it was still active; but once the robot rounded a bend in the shaft, all communication ceased. During the next few hours, the engineering team could only sit and wonder what Groundhog was encountering, and if it was making the right decisions. If it emerges at the other end it will be a new era for mapping the underground world, said Sebastian Thrun of Carnegie Mellons Robotics Institute, just prior to deployment. Hes part of the team led by William Red Whittaker and Scott Thayer that developed Groundhog, in association with Workhorse Technologies LLC. Up to today there was no good three-dimensional volumetric mapping technology, Thrun said. Three-dimensional maps are a vast improvement over 2-D maps  providing information about the structural integrity of a mine in addition to positional data. Knowing whether an underground shaft is structurally sound can help mine owners make decisions about alternative uses of a shaft. In the case of the Mathies mine, they are considering running a water processing pipeline through the shaft. Structural information can also help people who own land above abandoned mines make building decisions. But Groundhog provides another  and perhaps more important  service: It keeps humans out of abandoned mines. A robot can create a more complete map by probing the recesses of the mine that may not be safe for human surveyors. Should a shaft collapse, the loss of a robot is preferable to the loss of life. This type of technology will enhance mine safety, says Bill Plassio of the Pennsylvania Department of Environmental Protection, which provided a grant to support the development of Groundhog. He estimates there are approximately 8,000 to 9,000 abandoned mines in western Pennsylvania alone, so the need for reliable mapping technology is great. Combining these technological and safety benefits into a working prototype involved solving many hardware and software challenges. To overcome the problems of traversing the rough terrain inside the limited space of a mine shaft, the researchers designed Groundhog as a rugged four-wheel vehicle. Weighing about 1,600 pounds, and measuring approximately 37 inches high by 39 inches wide by 60 inches long, it is powered by six 8-volt batteries that provide about 10 hours of operation. Electronic components sit in an explosion-proof enclosure to prevent ignition of mine gases; gas sensors provide additional safety by enabling a shutdown of the vehicle in the event of dangerous concentrations. A gyroscope keeps the vehicle on course; tilt sensors prevent it from tipping over; and float sensors tell Groundhog when it has wandered into water too deep for it to handle. On both the front and rear of the vehicle, sensor units containing a 180-degree laser range finder, headlights and a low-light camera make it possible for Groundhog to back up if it encounters an obstacle. The sensor units swivel up and down to look at the ceiling and the floor of the mine shaft, checking for obstacles or roof subsidence that might prevent its passage, while constantly scanning the walls at the same time. The echo of the laser light provides the data needed to determine the distance to a particular object. 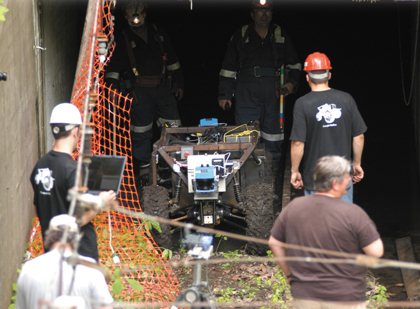 Although Groundhog has explored other mines over the past year, the first real test of this mission was the robots autonomous operation in Mathies mine. Once the start command was given, Groundhog was on its own. The engineers could not issue instructions; sophisticated software onboard the robot was responsible for all movement decisions. Using its laser sensors, Groundhog attempted to map out a safe path to travel, avoiding holes, water and other obstacles in its path. The fundamental logic is like a rat in a maze, Whittaker said. Groundhog is discovering its environment and making decisions as it goes along. All the while, it stored 3-D data on the shape of the shaft in its onboard memory. The Carnegie Mellon team monitors Groundhogs movements and decisions as it traverses the abandoned mine. After traveling 308 meters, the robot decided to turn back after encountering a fallen roof beam in the middle of the shaft. At 1:44 p.m., Thrun announced that Groundhog had traveled 308 meters into the mine, where it encountered an insurmountable obstacle. At this point it made the absolutely perfect decision  I cant move forward, so Ill go back, Thrun said. After traveling about 130 meters in reverse, the robot began to malfunction. The engineers were able to download some data from Groundhogs memory at this point: The data showed that it had encountered a fallen roof beam in the middle of the shaft at the 308-meter point. Shortly after the downloading operation, operators lost radio communication with Groundhog. At about 2:50 p.m., they called the mission off, with the robot still in the mine. Later, mine safety officials obtained the necessary clearances to enter the mine and manually restart the robot, which enabled the team to retrieve Groundhog and download its data. Despite the aborted run, the team was satisfied with Groundhogs performance. We achieved autonomous navigation without communication with the robot, Thrun said. They were also able to provide the mine owner with valuable information on the structural integrity of the shaft. Said Whittaker: Today was just planting a first seed. We now have a new toolkit in the mining, mapping and rescue trade. Future developments might include cigar-shaped robots that can be dropped into bore holes and then unfold into roving vehicles once inside the shaft. Researchers are also looking into robotic minefish capable of maneuvering through and mapping flooded shafts. Along with Groundhog, such robots could give miners the information they need to prevent another Quecreek incident. Palucka is a freelance writer based in Pittsburgh, Pa.